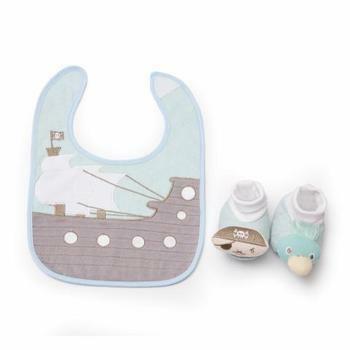 DEMDACO of Leawood, Kan., is recalling about 1,500 infant bib and bootie sets. The multi-colored pastel sets were sold in six different child themes and have serial numbers ranging from 5004700491 to 5004700496. The serial number can be found on the side of the bib. The sets were sold under the brand name Nat & Jules. Rattle attachments sewn into the booties coordinate with the theme. The infant bib and bootie sets, manufactured in China, were sold at Christus Health Retail Systems, Joseph-Beth Booksellers, More Than Words, The Mole Hole of Peddlers Village & Eash Sales from June 2017, through August 2017, for about $25. Consumers may contact DEMDACO toll-free at 888-336-3226 between 8 a.m. and 5 p.m. (CT) Monday through Friday or online at www.demdaco.com and click on Recall Info for more information.